These terms and conditions ("Terms", "Agreement") are an agreement between Costello's Bakery Ltd ("Costello's Bakery Ltd", "us", "we" or "our") and you ("User", "you" or "your"). This Agreement sets forth the general terms and conditions of your use of the costellosbakery.com website and any of its products or services (collectively, "Website" or "Services"). You shall pay all fees or charges to your account in accordance with the fees, charges, and billing terms in effect at the time a fee or charge is due and payable. Sensitive and private data exchange happens over a SSL secured communication channel and is encrypted and protected with digital signatures, and our Website is also in compliance with PCI vulnerability standards in order to create as secure of an environment as possible for Users. Scans for malware are performed on a regular basis for additional security and protection. If, in our judgment, your purchase constitutes a high-risk transaction, we will require you to provide us with a copy of your valid government-issued photo identification, and possibly a copy of a recent bank statement for the credit or debit card used for the purchase. We reserve the right to change products and product pricing at any time. We also reserve the right to refuse any order you place with us. We may, in our sole discretion, limit or cancel quantities purchased per person, per household or per order. These restrictions may include orders placed by or under the same customer account, the same credit card, and/or orders that use the same billing and/or shipping address. In the event that we make a change to or cancel an order, we may attempt to notify you by contacting the e-mail and/or billing address/phone number provided at the time the order was made. This Agreement does not transfer to you any intellectual property owned by Costello's Bakery Ltd or third-parties, and all rights, titles, and interests in and to such property will remain (as between the parties) solely with Costello's Bakery Ltd. All trademarks, service marks, graphics and logos used in connection with our Website or Services, are trademarks or registered trademarks of Costello's Bakery Ltd or Costello's Bakery Ltd licensors. Other trademarks, service marks, graphics and logos used in connection with our Website or Services may be the trademarks of other third-parties. 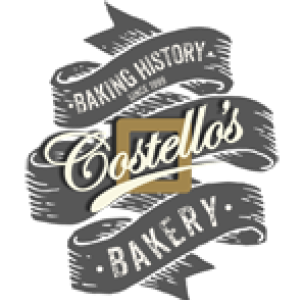 Your use of our Website and Services grants you no right or license to reproduce or otherwise use any Costello's Bakery Ltd or third-party trademarks. To the fullest extent permitted by applicable law, in no event will Costello's Bakery Ltd, its affiliates, officers, directors, employees, agents, suppliers or licensors be liable to any person for (a): any indirect, incidental, special, punitive, cover or consequential damages (including, without limitation, damages for lost profits, revenue, sales, goodwill, use or content, impact on business, business interruption, loss of anticipated savings, loss of business opportunity) however caused, under any theory of liability, including, without limitation, contract, tort, warranty, breach of statutory duty, negligence or otherwise, even if Costello's Bakery Ltd has been advised as to the possibility of such damages or could have foreseen such damages. To the maximum extent permitted by applicable law, the aggregate liability of Costello's Bakery Ltd and its affiliates, officers, employees, agents, suppliers and licensors, relating to the services will be limited to an amount greater of one dollar or any amounts actually paid in cash by you to Costello's Bakery Ltd for the prior one month period prior to the first event or occurrence giving rise to such liability. The limitations and exclusions also apply if this remedy does not fully compensate you for any losses or fails of its essential purpose. You agree to indemnify and hold Costello's Bakery Ltd and its affiliates, directors, officers, employees, and agents harmless from and against any liabilities, losses, damages or costs, including reasonable attorneys' fees, incurred in connection with or arising from any third-party allegations, claims, actions, disputes, or demands asserted against any of them as a result of or relating to your Content, your use of the Website or Services or any willful misconduct on your part. The formation, interpretation, and performance of this Agreement and any disputes arising out of it shall be governed by the substantive and procedural laws of North Yorkshire, United Kingdom without regard to its rules on conflicts or choice of law and, to the extent applicable, the laws of United Kingdom. The exclusive jurisdiction and venue for actions related to the subject matter hereof shall be the state and federal courts located in North Yorkshire, United Kingdom, and you hereby submit to the personal jurisdiction of such courts. You hereby waive any right to a jury trial in any proceeding arising out of or related to this Agreement. The United Nations Convention on Contracts for the International Sale of Goods does not apply to this Agreement.